Factory Fitted Ac With 3Sitters Very Strong And Durable Fit For Long And Rough Distance. Is Clean Ride With First Body, Factory Ac, Power Windows, And Sound System Working Efficiently, Just Buy And Drive. 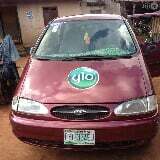 We sell to you nigerians on a cheaper rate.